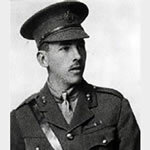 On 12 March 1915 at Spanbroekmolen on the Messines Ridge, Belgium, Lieutenant Martin volunteered to lead a small bombing party against a section of the enemy trenches which was holding up the advance. Before he started he was wounded, but, taking no notice, he carried on with the attack which was completely successful. He and his small party held the trench against all counter-attacks for two and a half hours until a general withdrawal was ordered.